The COP requested the LDC Expert Group (LEG) to elaborate technical guidelines for the NAP process based on the initial guidelines for the formulation of NAPs, and to arrange a review of these technical guidelines (decision 5/CP.17, paragraphs 15-16). The LEG organized a review meeting from 29 to 31 October 2012 in Bonn, Germany, to review a draft of the guidelines. The meeting was attended by experts and representatives of the Global Environment Facility (GEF), UN agencies and other relevant research, academic and non-governmental organizations. 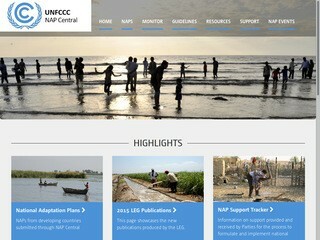 The technical guidelines for the NAP process are available for download in English, French, Portuguese, and Spanish. The NAP Expo took place from 11 to 15 July 2016 in Bonn, Germany. Using the NAP technical guidelines, the NAP Expo provided information on the NAP process, providing a platform for sharing, and offering a forum for questions and answers, and the exchange of ideas.